The pictured badge seems strictly ironic and we are quite sure that was the basic idea originally, but there is more truth in it than you may think. Should we feel guilty about driving our poison gas spitting machines in a time that the arctic areas are filling the oceans to the rim, while the tropics move north and the world is desperately looking into #mobility-concepts for the next generation? Should we slowly say farewell to the fun of archaic machinery, park our stuff in automotive mausoleums and move on to the world of tomorrow? 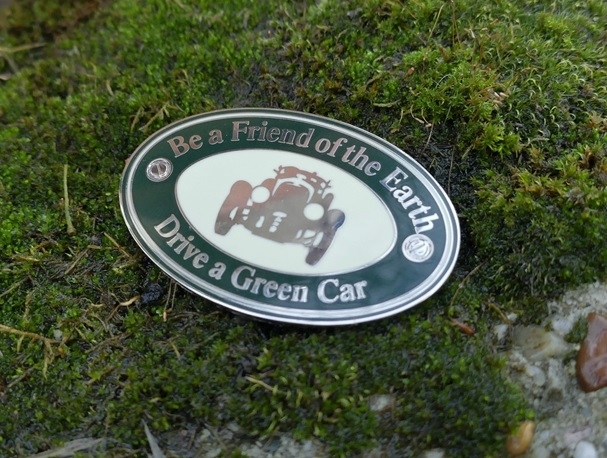 Perhaps we better wake up, pull our head out of the sand, turn around the perspective and start feeling proud being the caretakers of automobiles that – at least with respect to #sustainability – have the smallest #eco-footprint one can imagine. Yes, the exhaust fumes are a little setback, but there are solutions for that. Very simple yet radical solutions for the near future, and slightly more complex ones for a bit further down the road. Yes, instead of submerging in a defensive role and instead of closing our ears for the subject , we should step forward with solid, clean arguments and be examples to the world. Yet being a fine example instead of a littering crook doesn’t come easy as well. We need to make sacrifices. Something what is hard to copy with a modern car preferably. Following the 2015 #UNFCCC-Paris-agreement carbon dioxide production should be 30% down in 2020 and 50% in 2030. Very hard to realize with modern cars. But very easy – yet a bit painful - to realize with our vintage cars. How? As we don’t need our motorcars on a daily basis we only need to bring down our use of petrol with respectively 30 and 50 %. I like to start a group of people who openly state what their average hobby fuel consumption over the last three years was. No matter if you were using 5000 litre (for a Napier #Bentley driver, or a long distance rally afficionado) or 80 litre per year (BMW Isetta). A percentage in reduction is equally painful and equally effective to both. My personal hobby petrol average has been 1000 litre over the last three years. So I have decided to reduce consumption in 2019 with 15% , and in 2020 I will not use more than 700 litres. In that way we are equal with ‘Paris’. (Who is to join in with this 'petrol reduction group'? Don’t be shy. As said - aside #petrol consumption and bad fumes - our cars are the finest examples of sustainability and have Micky Mouse like eco footprints. When you’re at home in the subject you may know that the production of a new car equals with 3 years of driving a modern car. The amount of carbon dioxide involved with mining ore, the transport of raw materials to factories, building facilities, commuting workers and the transport of new cars to distributors and so on and so on is massive. On the other hand , our classic and even better vintage cars were produced in a time when raw materials came from relatively nearby, when factories were nearby and workers came on foot. So the production footprint of our cars is not only long forgotten but it was very much smaller as well. Then after let’s say a 15 year life cycle one needs to scrap and recycle these ugly modern machines, which is a good thing. By the way, did you know that #HenryFord was recycling cars already in the late twenties? There are photos from the US showing a huge parking lot outside Detroit with hundreds of cars waiting to be scrapped for their metals. #Recycling is good, but once more there are considerable amounts of carbon dioxide involved, whereas our cars don’t need to be recycled. While I am reducing my petrol intake, I keep hoping that some of the ingenious engineers in our hobby have started thinking about alternatives for petrol in our cars. My personal view is that #liquified-hydrogen is the best bet for a more distant future. There must be a way to use this in a nearly similar way as #LPG with a subtle and thin brass feed of hydrogen & oxygen behind the carb in the intake manifold. Or? Lacking a racing green vintage Bentley like in the badge, I wouldn’t mind converting my Amilcar or Model T to the use of fluid hydrogen, unless the engine bay would start looking like my kitchen sink plumbing. Still I would have a light preference for using the Model T. Why? My 1924 Touring has – as from factory – black wings with the body tub in green.